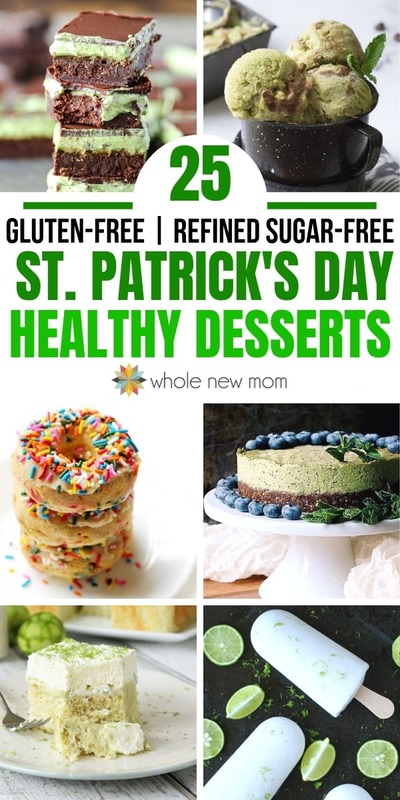 St. Patrick's Day is a fun and meaningful day to celebrate, but most of the desserts made for this day include loads of sugar and artificial food coloring. 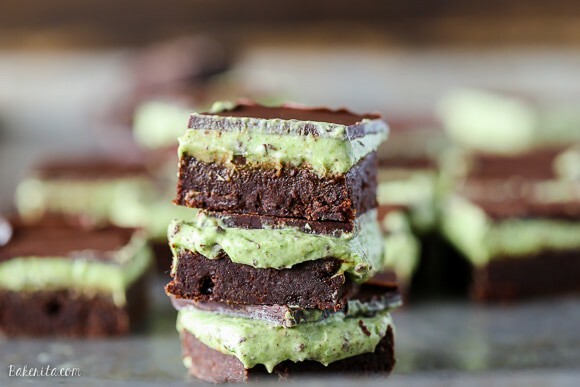 We've put together a list of Healthy St. Patrick's Day Desserts to help you celebrate without the guilt! Saint Patrick's Day holds a special place in my heart. My father is from Dublin, Ireland and March 17th was my late mother's birthday. In fact, most of my father's relatives still live on the Emerald Isle and my father has just moved back to Ireland–we miss him! Studied at Trinity College. But the courses were in Irish History and Literature so I don't recall much. Just ask my husband – I'm a math and science brain for sure! Spent loads of time with relatives. Enjoyed all the funny names for things like the word “crisps” for potato chips. Walked into a pub on the Western side where everyone was speaking Gaelic, Ireland's native language. Patrick was from Britain, born near the end of the fourth century. When he was sixteen, he was kidnapped by Irish raiders and forced to tend sheep in Ireland. His trials led him to seek God. One day he thought he heard God telling him to flee his captors, so he did. He was caught again and put into slavery, but again escaped and returned to Britain. He had another “vision” from God calling him back to Ireland. There, he studied with priests, became a priest and a deacon, and eventually Bishop of Ireland. We don't participate in all of the alcohol, etc., but I like to celebrate on some level. I'd love to do the whole naturally corned beef and all that, but sometimes just having a few fun green or rainbow-themed treats is enough and is a great way celebrate as well. It's more about the Leprechaun tales than the real St. Patrick, but you can always tell the real story along with the fabricated tales. Of course, if you'd like to have a more simple meal for St. Patrick's Day, you could serve up this Paleo Shepherd's Pie with Roasted Vegetables. It's lovely. 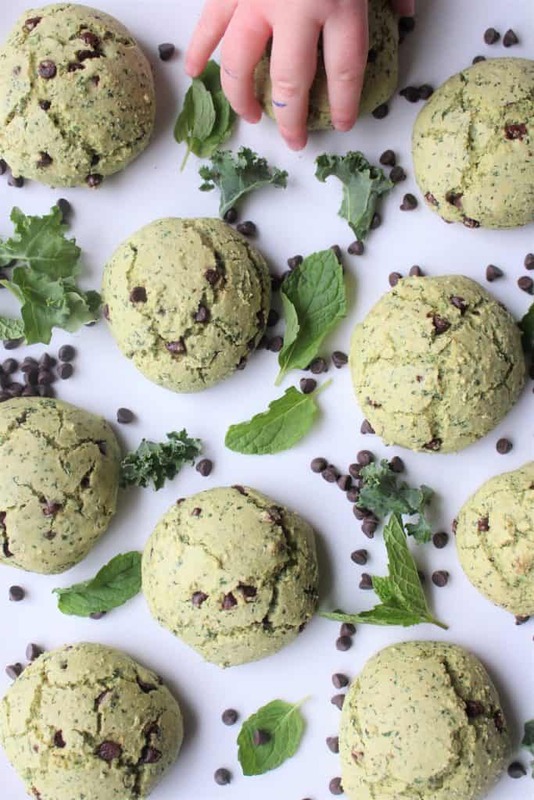 So here are some Healthy St. Patrick's Day Treats to enjoy with friends or family. I do so hope you enjoy them and better health as well. 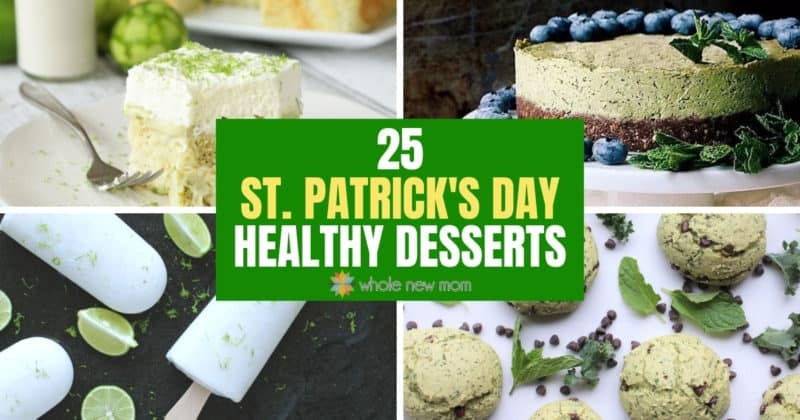 These Healthy St. Patrick's Day Desserts are a great way to celebrate the Patron Saint of Ireland without the guilt. 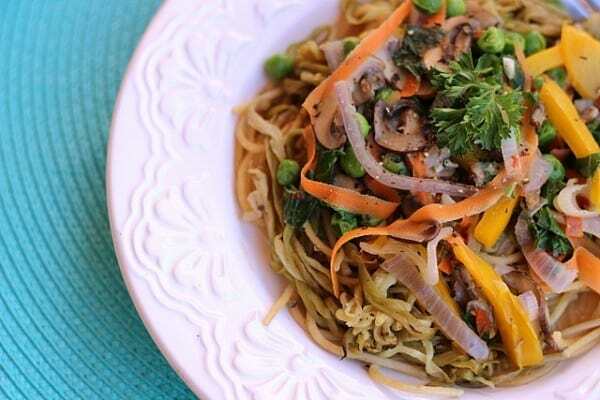 These recipes are all gluten-free with no artificial colors. I've added special diet tips for those who need them. Enjoy! 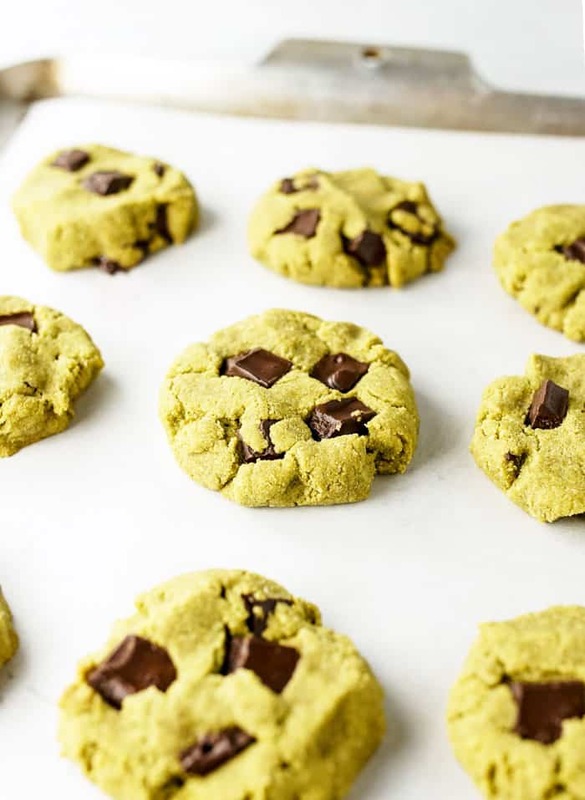 These Mint Chocolate Chip Cookies are such a great idea for a healthy St. Patrick's Day Dessert! If you need to avoid eggs, try my Powdered Egg Replacer or another egg alternative like a flax or chia egg. For low-carb, use a low-carb sweetener instead if needed and low-carb chocolate chips too--also sub almond flour for the arrowroot using the recommendations in my Pumpkin Snickerdoodles post. 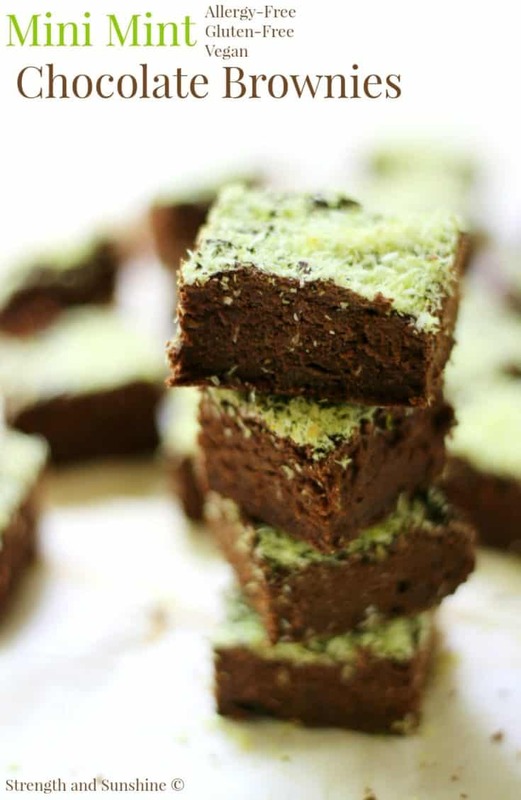 Mint and chocolate are always a favorite--and when brownies are involved, it can't get much better. If you are in need of avoiding the grain, you can use almond flour for this recipe--just adjust the other ingredients. I have some information to that end in my Pumpkin Snickerdoodle post. 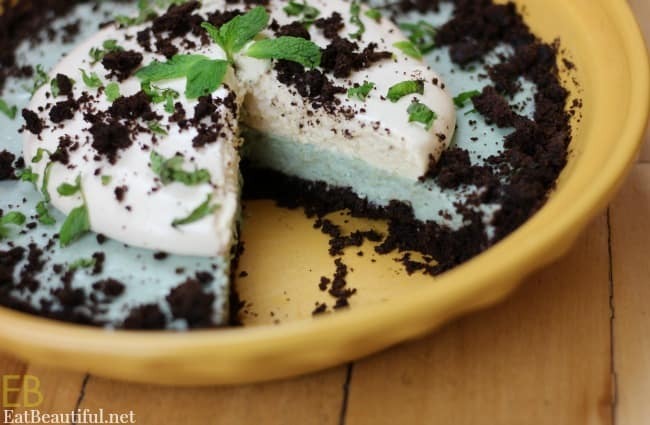 Can you guess what gives this Mint Fudge its natural green color? Hint: It's not spinach! 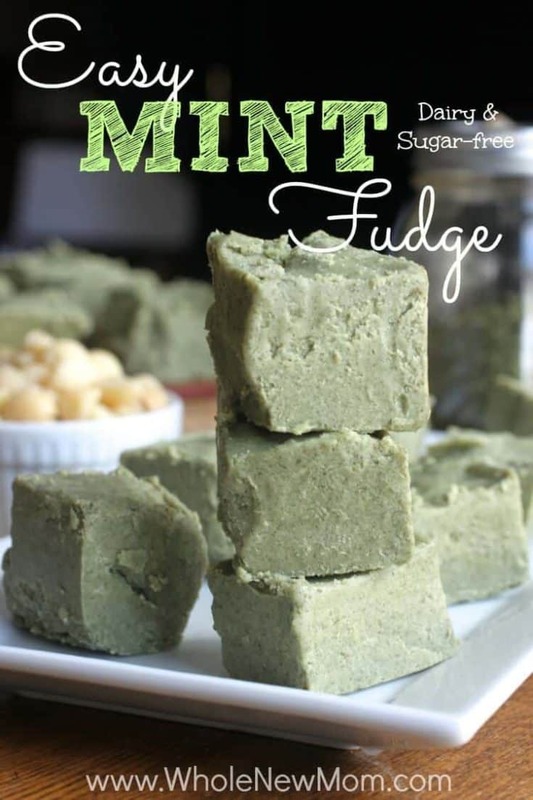 This paleo mint fudge is lightly mint flavored, dairy-free, vegan, and low-carb too. 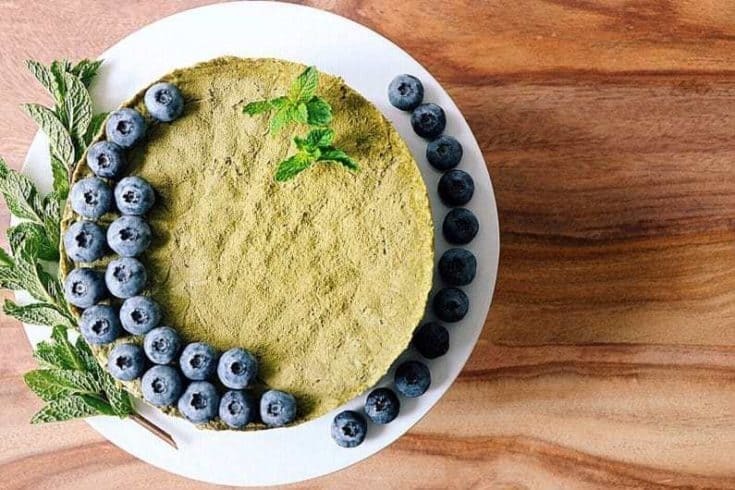 Doesn't this Grasshopper Pie look amazing--and the green is all natural from nutrition-packed spirulina! You can make this lower carb by using almond flour for the crust and choosing a low-carb sweetener, and an egg replacer should work fine for those who need it. 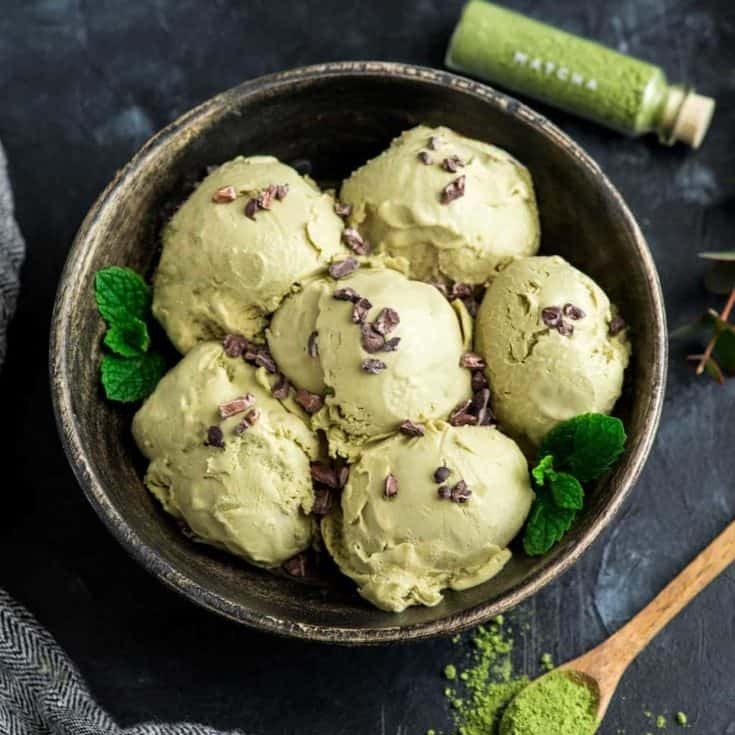 I can just taste this ice cream now--so creamy and delectable and made with the goodness of matcha. Substitute in a low-carb sweetener if need be. 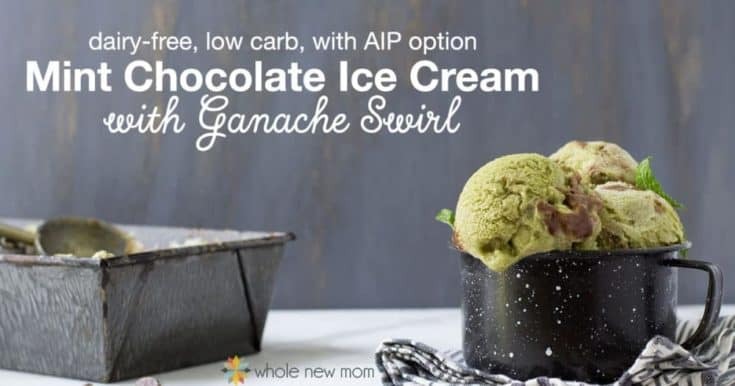 This dairy-free mint chocolate ice cream is naturally colored with fresh mint and has a fun twist on traditional mint chocolate chip ice cream. Instead of chips, it has a creamy ganache swirl throughout. What a fun treat for kids and adults alike! And look at that vibrant green--who needs artificial colors when you can have this naturally? "Nice Cream" typically is made from frozen bananas, but not in this case. 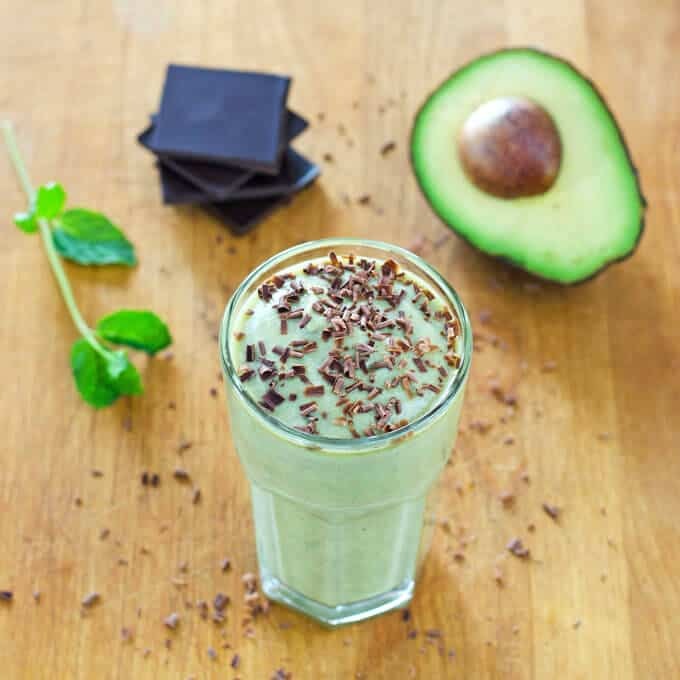 The "nice" in this case (and the color, of course) comes from the highly-revered nutritional powerhouse, the avocado. Use a low carb sweetener if desired. 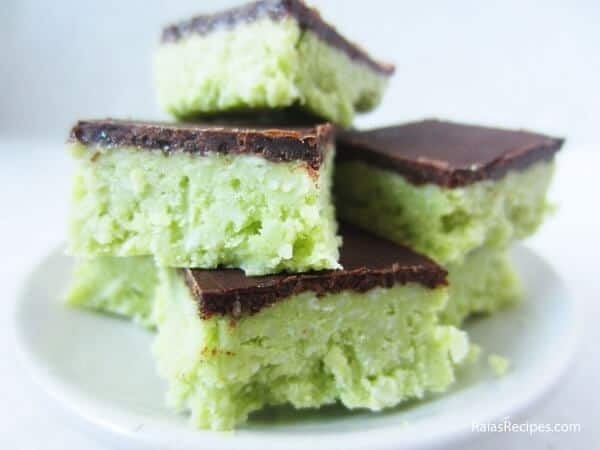 No need to turn on your oven for these Grasshopper Bars. The lovely avocado stars again in these delicious No Bake Chocolate Mint Bars that are easily done low-carb, vegan, AIP, and are THM too. I love so much about these brownies! 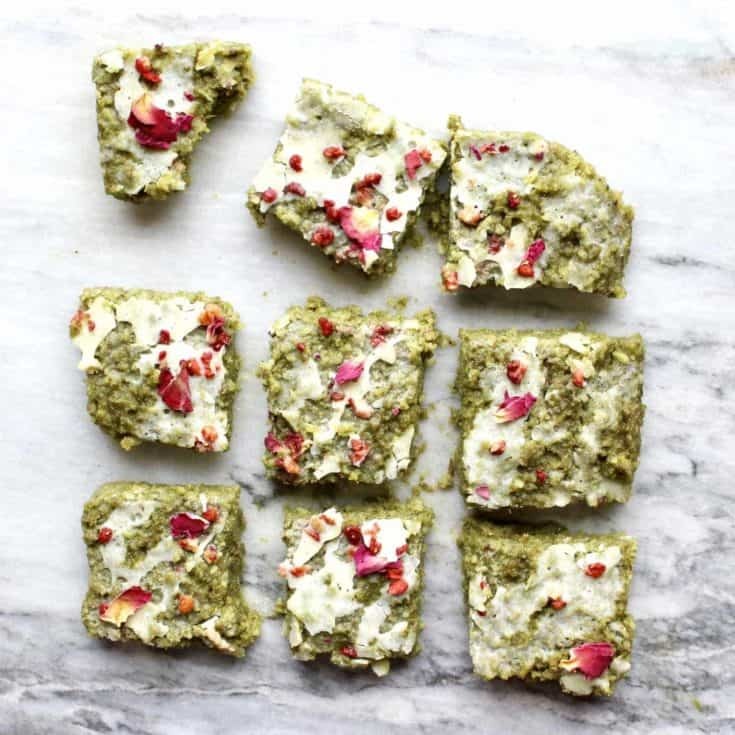 Lightly colored and with all of the benefits of matcha, topped with freeze-dried fruit and even rose petals. If you're watching carbs, you can change out the sweeteners but the dates will be hard to substitute. You could try a chia blend with water or maybe couple that with coconut and made into a paste with added sweetener. 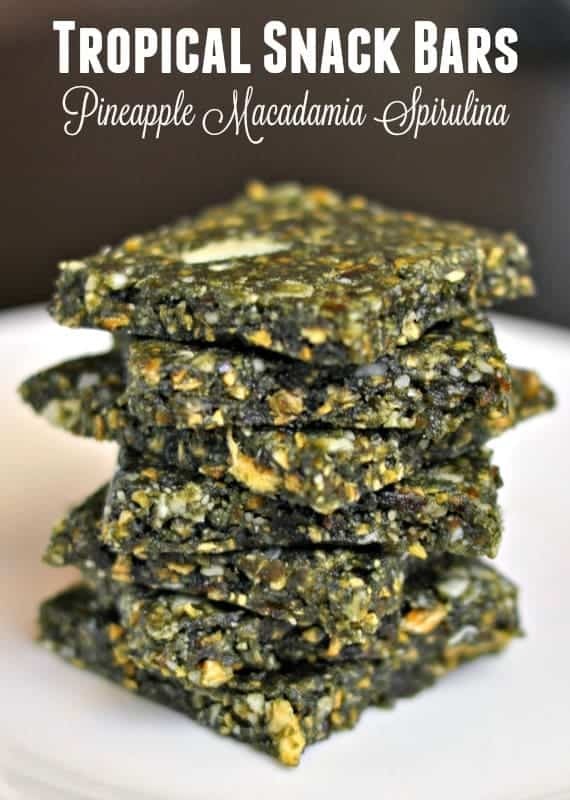 Top off your meal with these bars that are packed to the brim with nutrition from pineapple, macadamia, and spirulina. These would not be able to be done lower carb unless you are really creative with coconut butter and added sweetener perhaps. What a great healthier alternative to the popular sugar and green-food-coloring laden drink in a certain fast food restaurant--drink up! 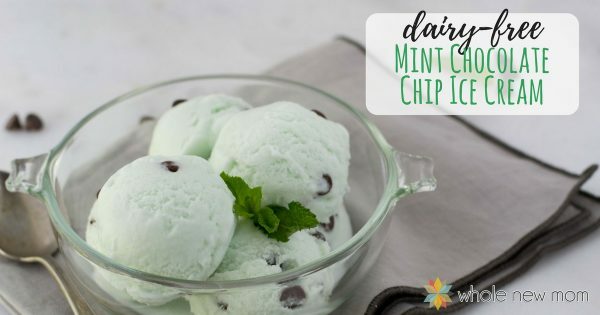 Mint Chocolate Chip Ice Cream is a favorite with many ice cream lovers. 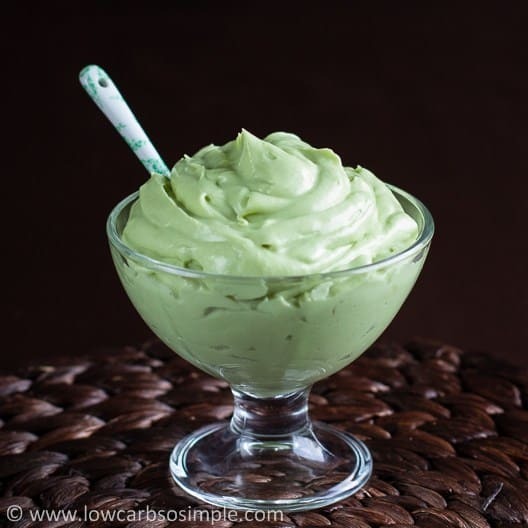 Round out your St. Patrick's Day Celebration with this dairy-free, low-carb, naturally colored version of this classic ice cream. 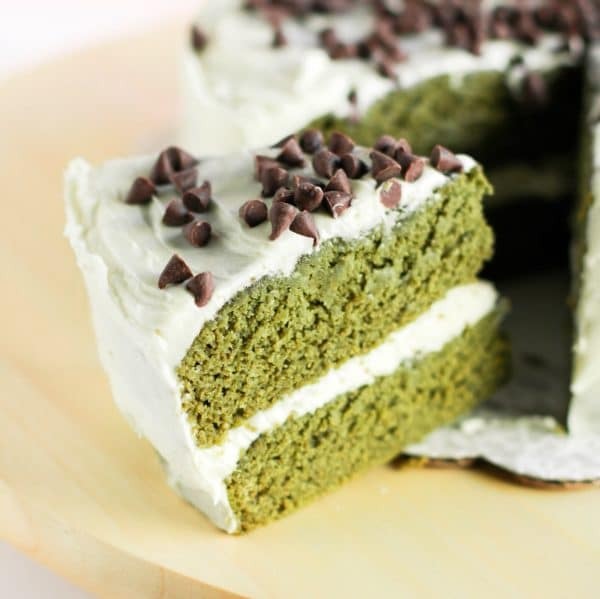 This cake's rich green color comes from spinach which adds loads of nutrition to this delectable dessert. 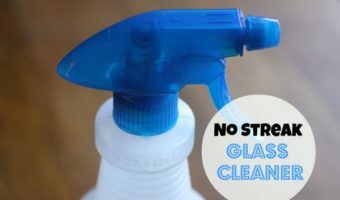 If you are avoiding eggs use an egg substitute. Those avoiding grains and carbs could use almond flour instead, making appropriate adjustments to the recipe. 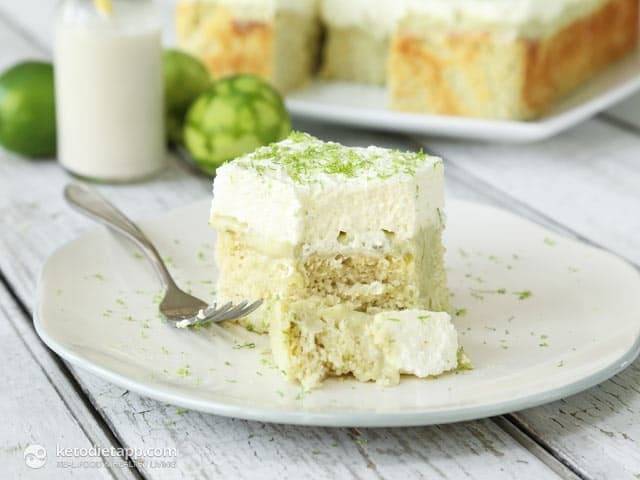 This Keto Key Lime Poke Cake looks delicious, light, and flavorful! 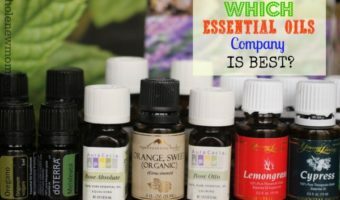 If you need to avoid eggs, this will be a tough one to substitute for so I would choose another option, but it could be done. Use a vegan curd for the filling and use an appropriate egg replacer for the cake. These brownies are almost exactly what I used to make when I was younger--but done healthier! 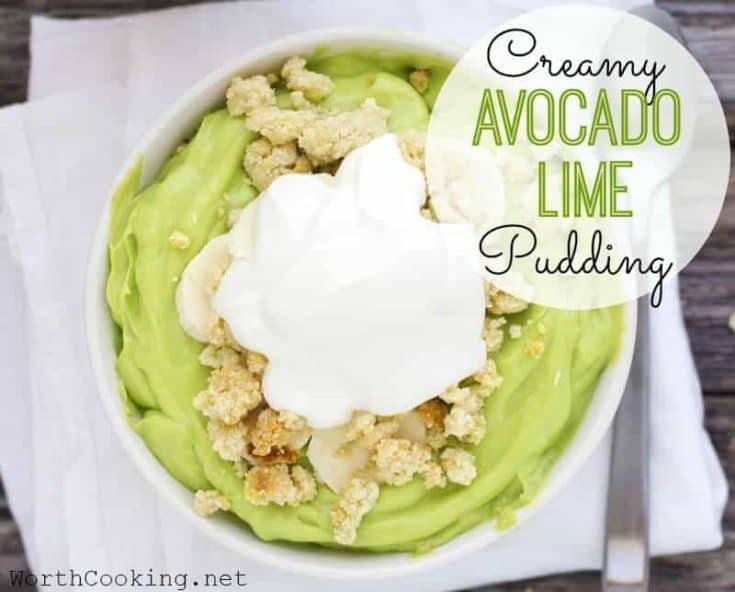 If you are low carb just replace the sweetener and an egg substitute should work pretty well for this recipe. 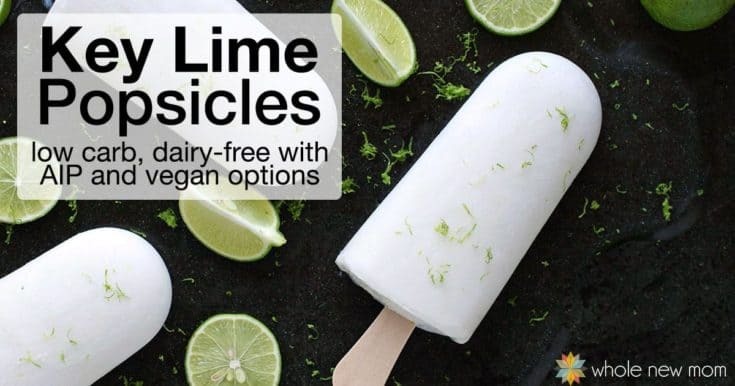 These Dairy-free Key Lime Popsicles are a great refreshing treat for your St. Patrick's Day celebration. They work for a low-carb diet and can be made vegan too. This tart is a gorgeous dessert option that will make any St. Patrick's Day celebration extra special. If you are on a low carb diet, try substituting coconut for the dates in the crust and either coconut cream or avocado for the banana--some extra low carb sweetener will be needed as well. Kids of all ages are sure to love these rainbow-themed gluten-free doughnuts. If you are avoiding carbs, this is a tough recipe to alter. If you are on the THM eating plan, these are an E recipe. 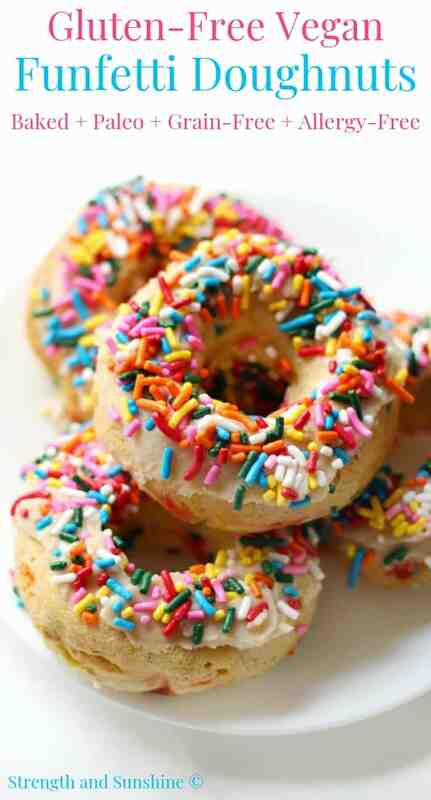 For paleo, you will have to omit the sprinkles or make your own. 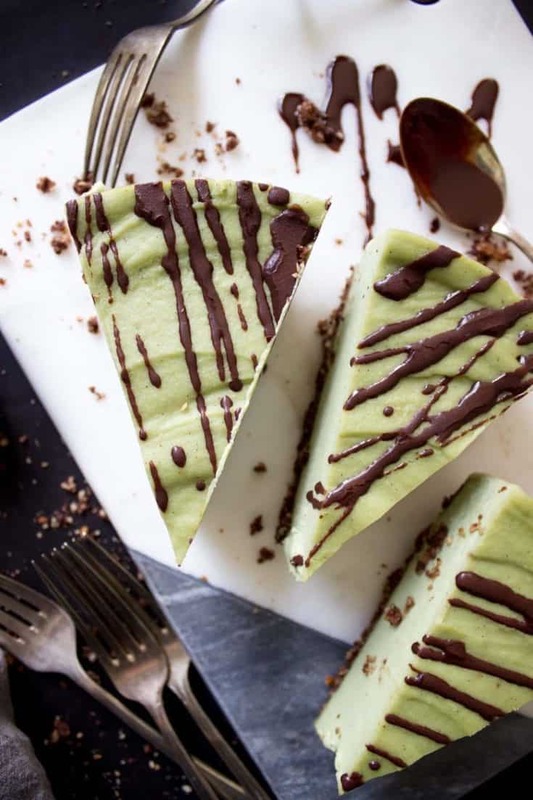 This is a fantastic Cheesecake that's Raw, Vegan and made with the super nutrition powerhouse Matcha. If you need to reduce the carbs, you could probably use some coconut instead of the dates and a low carb sweetener as well. 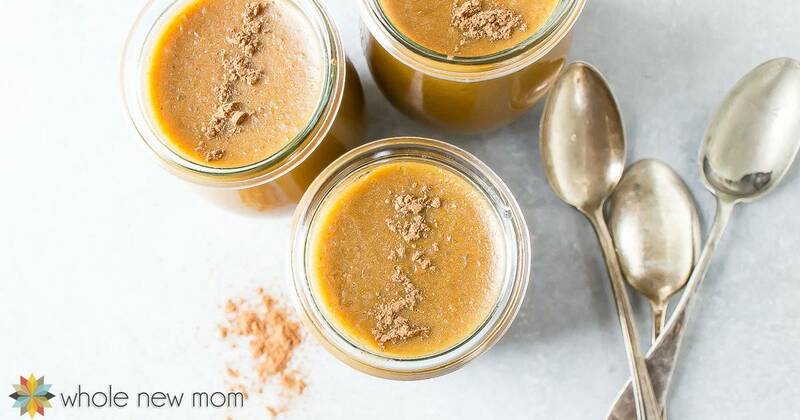 Skip the boxes with "who knows what" or rather "you know what and it's bad" ingredients and make this just as fast "instant" vanilla pudding instead! I can't wait to make these! Make sure to use a low-carb sweetener and low-carb chocolate chips (or make my Homemade Choc Chips) if you need to reduce the carbs. Andes Candies were always a favorite of mine growing up. Love this adaptation into a healthful bar. For low-carb use a low-carb sweetener instead. Whatever you choose to do, I hope this Saint Patrick's Day finds you healthy and enjoying loved ones around you. 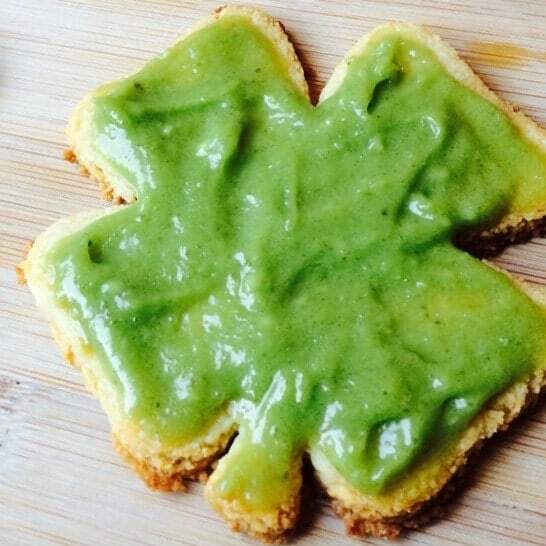 Which Healthy St. Patrick's Day Dessert is your favorite? I want them alllll! 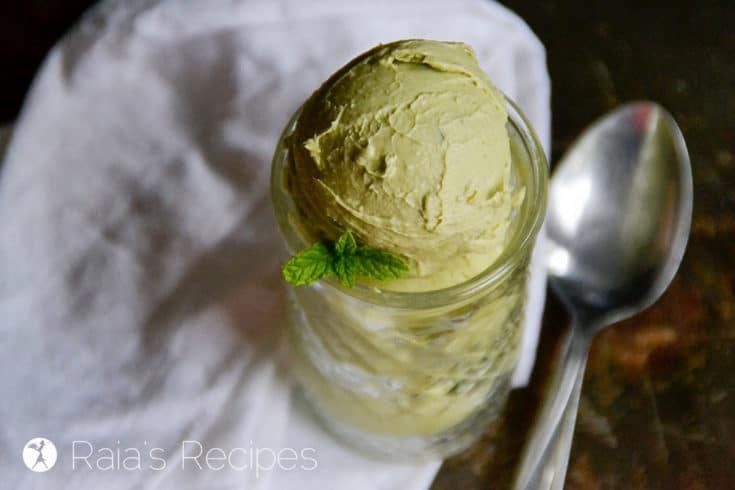 Thanks for including my avocado mint nice cream! Me too and you are so welcome! I was really happy to see how low in carbs it is! I’d love to make natural corned beef. Will have to see if I can find a recipe. One of my favorite books is called How the Irish Saved Civilization by Thomas Cahill, a historian who wrote a series of books on key turning points in history that greatly influenced the world we live in today. Anyway, it has great, detailed history about St. Patrick in there. I’m not Irish, but I love history and I learned so much in this book about St. Patrick and Ireland.. It’s a great, great book, as are all of them in the series. That sounds great! I made a note to get it out of the library. Thanks! Loved that book! Whatever happened to my copy? I really didn’t know the story of St. Patrick’s Day. In fact, I really didn’t realize I didn’t know it until I read your post. 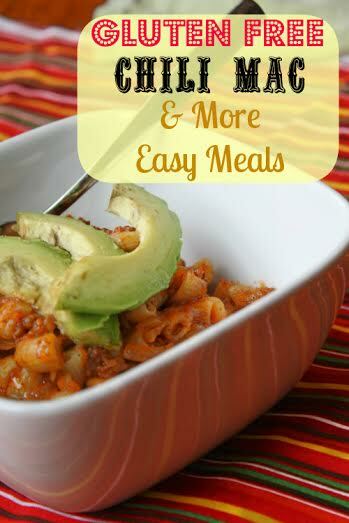 Great recipes and great info! Interesting post! We were missionaries in Hungary, and they also sell and store their eggs at room temperature. I knew St. Patrick was a Christian, but had forgotten his story. Thanks for the reminder. God bless! You’re welcome – I’ve never been to Hungary. One of the places I wanted to visit when I was in Europe. Blessings to you as well.